Ask someone if they know the names of the astronauts who have walked on the Moon, and most people would be able to list Neil Armstrong, and maybe even Buzz Aldrin. But can you name the rest of the Apollo astronauts who made it down to the lunar surface? How many people have walked on the Moon? In total twelve people have walked on the Moon. 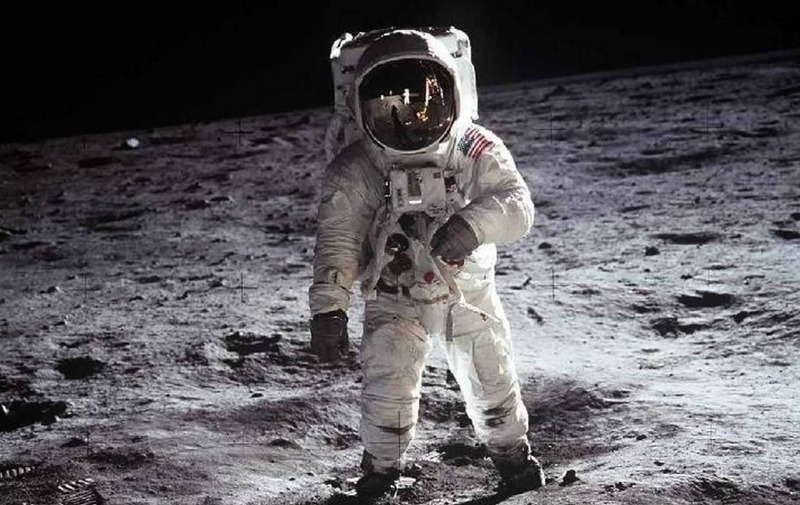 Besides Neil Armstrong and Buzz Aldrin – who were the first two astronauts to leave their bootprints on the Moon — there were also Pete Conrad, Alan Bean, Alan Shepard, Edgar Mitchell, David Scott, James Irwin, John Young, Charles Duke, Eugene Cernan, and Harrison Schmitt. Interestingly, out of the dozen people who walked on the Moon, no one ever did it more than once. On July 21, 1969, Neil Armstrong made history by becoming the first person to set foot on the Moon. He was soon followed by Buzz Aldrin. In a nail-biting landing, Armstrong had to manually fly the Lunar Module past the intended landing spot, which he could see was filled with boulders. He landed safely in Tranquility Base with Aldrin keeping an eye on the altitude and velocity, along with a dangerously low fuel tank. In total, Neil and Buzz were on the lunar surface (both inside their Eagle lunar module and walking on the Moon) for only 21 hours, 36 minutes and 21 seconds and were outside walking in the Sea of Tranquility for just 2 hours, 31 minutes and 40 seconds. During their EVA, they collected rocks, planted the US flag, and deployed a seismograph and an experiment called the Lunar Ranging Retroreflector – a reflective device that measures the distance between the Earth and the Moon using lasers from Earth — which is still in use today. A bootprint in the lunar regolith, taken during Apollo 11 in 1969. Credit: NASA. Pete Conrad and Alan Bean were the Moon walkers on the Apollo 12 mission. The Apollo 12 crew experienced two lightning strikes just after their Saturn V rocket launched on November 14, 1969. The jolts knocked out the guidance system and power for a time, but thanks to quick thinking by Mission Control and Alan Bean, the systems were recovered. The Apollo 12 crew proved they could make a pin-point landing, touching down just 185 meters (600 feet) from the Surveyor 3 unmanned spacecraft. During one of their EVAs, Conrad and Bean walked to the Surveyor 3 spacecraft and removed pieces of it bring back to Earth for analysis. Conrad and Bean were on the Moon for two days, November 19 and 20, 1969. The next mission to launch to the Moon was Apollo 13, but because an oxygen tank on the spacecraft’s Service Module exploded two days after launch, the crew was not able to land on the Moon – and a harrowing and spectacular recovery ensued. You can find out more about the Apollo 13 mission here. The launch of Apollo 14. Credit: NASA. The next two people to set foot on the Moon were Alan Shepard and Edgar Mitchell who were part of the Apollo 14 mission. They launched on January 31, 1971, and landed on February 5 in the Fra Mauro region of the Moon, the original destination for Apollo 13. Shepard and Mitchell performed two EVAs, deploying seismic experiments to study potential Moon quakes, and used the Modular Equipment Transporter (MET), a pull cart for carrying equipment and samples. During the second moonwalk, they tried to reach the edge of a crater named Cone Crater, but with no obvious landmarks amid the rolling, repetitive terrain, they weren’t able to find it. Later analysis combining images the astronauts took with orbital images, it was determined the duo had come within just 20 meters (65 feet) of the crater’s rim. While on the Moon, Shepard fashioned a golf club and hit a couple of golf balls. Mitchell joined in by throwing a lunar scoop handle javelin-style. David Scott and James Irwin landed on the Moon on July 31, 1971 for the Apollo 15 mission, staying for three days, until August 2nd. Unlike the previous missions which landed on the flat lunar plains, the Apollo 15 landed between two mountains in an area called Hadley Rille. The two astronauts spent 18½ hours outside the spacecraft on lunar extra-vehicular activity (EVA), and this time the Apollo crew brought along the first lunar rover, which allowed them to travel much farther from the Lunar Module than previous missions. During three moonwalks, Scott and Irwin deployed several science experiments and collected 77 kg (170 lb) of lunar rock samples. 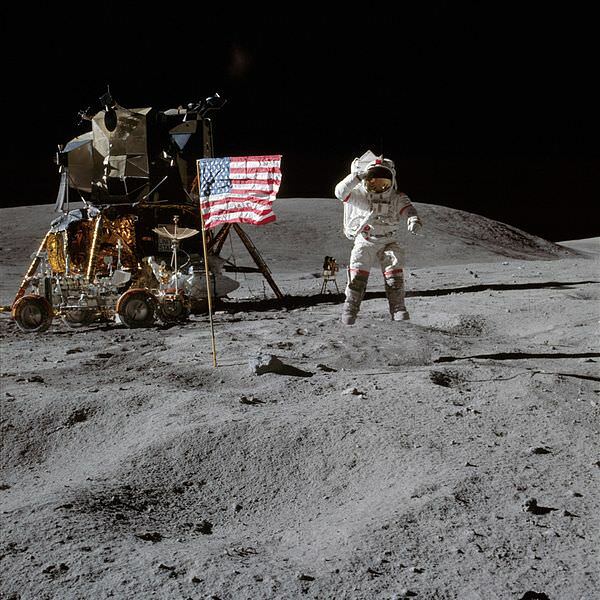 John Young – caught mid-leap – salutes the American flag on the lunar surface. Credit: NASA. John Young and Charles Duke were the next men to walk on the Moon with the Apollo 16 mission. When the crew reached lunar orbit, the mission almost had to be aborted because of a problem with Command/Service Module’s main engine. They landed though, and it was the first mission to land in the lunar highlands. They were on the lunar surface for three days, from April 21 to 23, 1972. 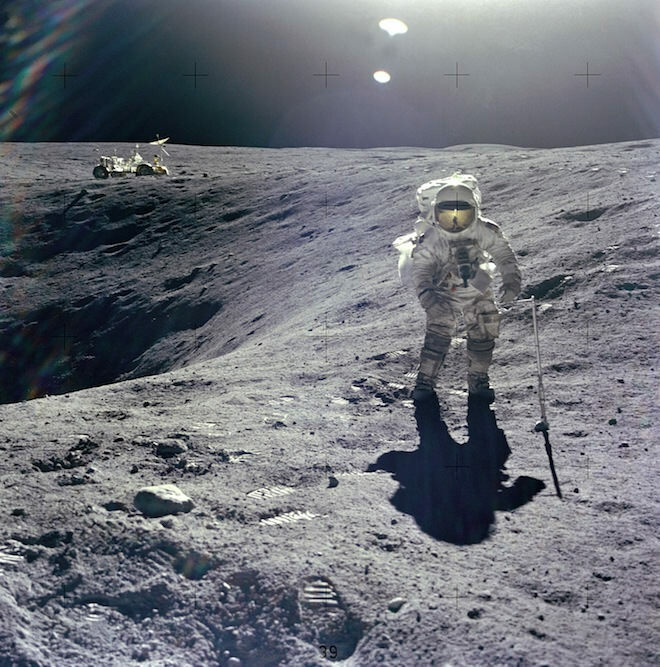 John Young and Charles Duke spent 71 hours — just under three days — on the lunar surface, during which they conducted three moonwalks, totaling 20 hours and 14 minutes. The pair drove the lunar rover a total of 26.7 kilometres (16.6 miles). Eugene Cernan on the lunar surface, December 13, 1972. Credit: NASA. The final people to walk on the Moon were Eugene (Gene) Cernan and Harrison (Jack) Schmitt. They launched of the first night-time liftoff of the Saturn V rocket, and the astronauts of Apollo 17 landed on the Moon on December 11, 1972. Their three-day stay on the Moon lunar surface included three moonwalks,where they collected lunar samples and deployed scientific instruments. The Apollo 17 crew returned to Earth on December 19 after a 12-day mission. Before he left the Moon, Cernan scratched the initials of his daughter Tracy into the lunar regolith. Since the Moon does not experience weather conditions like wind or rain to erode anything away, her initials should stay there for a very long time. And since 1972, no person has been either on the Moon or in lunar orbit. And even though no one has landed on the Moon more than once, three different astronauts have actually traveled to the Moon more than once. Jim Lovell orbited the Moon on Apollo 8 and flew around the Moon on the aborted Apollo 13 mission. John Young and Gene Cernan were both on Apollo 10 which orbited the Moon, and then later Young walked on the moon on Apollo 16, and Cernan walked on the Moon during Apollo 17. Apollo mission. An achievement far ahead of its time and a travesty that nobody has been back for over 40 years. In 2011/12, Frederic Moynier, Cosmochemist and Astrobiologist, finally proved the Giant Impact theory of lunar origin, by measuring differential fractionation of Zinc isotopes on samples retrieved from several locations on the Moon, and 20 terrestrial locations. This fractionation requires intense generalised heating and shocking of the Moon, due uniquely to a massive impact c. 4.5 billion years ago. This discovery was only possible because of the careful curation of samples RETURNED from the Moon by astronauts, including a professional geologist to await the day when superior assaying/analysis equipment became available. In the 1970’s although the Giant Impact Theory emerged as the one which ticked the most boxes, the lack of evidence of fractionation of Zinc isotopes due to the Impact stood as a worrisome niggle. 1/ It helped to prove the absolute superiority of Free enterprise systems over autocracy on grounds of efficacy, as well as in morality- without a military , lethal, trial of strength. Would-be fighters/zealots for Earth against Humans, please note. 4/ The task before us now is to build on this achievement, routinely, at from 1% to 10 % of the equivalent cost. Over to SpaceX , Reaction Engines Ltd, et al…? Apollo was a great success, but it only proves we decided to go and we had a country rich enough to support it. Free enterprise doesn’t enter into it. Von Braun’s team worked under fascism; the Soviet team worked under communism. They both had tremendous successes, and when working in economically much poorer countries as well. That doesn’t say anything about which economic and political system is better. How many people have been to the moon more than once? Counting lunar orbit and Apollo 13 fly-by? I think that Conrad and Lovell were in that club. 3 have visited the moon more than once. Jim Lovell orbited the moon on Apollo 8 and flew around on 13. John Young and Gene Cernan orbited on Apollo 10; Young walked on the moon on Apollo 16, Cernan on Apollo 17.